A sometimes difficult but striking alpine native of China, the Turk's Cap flowers of Lilium taliense vary from snow white with just a few purple spots to nearly black in heavily spotted specimens. It is found at high elevation from 6,000 to 7,200 ft. (1800 to 2200 m) in SE Sichuan, Nanchuan Xiam forests stems range from 24 to 60 inches (70 to 150 cms) in height producing up to 5 or 6 flowers in July and August. Seed is ripe in late September and is epigel in germination with best results coming from early sowing according to Eddie McRae in his book 'Lilies A Guide for Growers and Collectors'. Grown in abundance by Jan de Graaff and part of the parentage of his old 'Harlequin Hybrids' selected from his famous "Midcentury" lines. Though found in limestone soils in nature, it has grown well in neutral as well as slightly acidic soils in Oregon and Washington States. 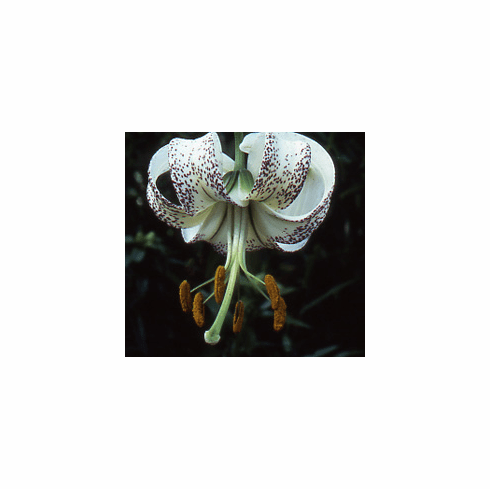 Photo inset #1 is of an exceptionally heavily spotted and highly distorted flower of Lilium taliense, grown by Ed McRae while at Oregon Bulb Farm. Photo inset #2 is of Lilium taliense, as grown and photographed and contributed by Ed McRae while at Oregon Bulb Farm.